Techni-Core is now a Forcepoint Partner! Home|Techni-Core Blog|Techni-Core is now a Forcepoint Partner! In case you missed the news on our social media, Techni-Core is now a Forcepoint Global Partner! Forcepoint is a Raytheon company offering the industry’s leading suite of cybersecurity, data protection and compliance tools for business and government sectors. 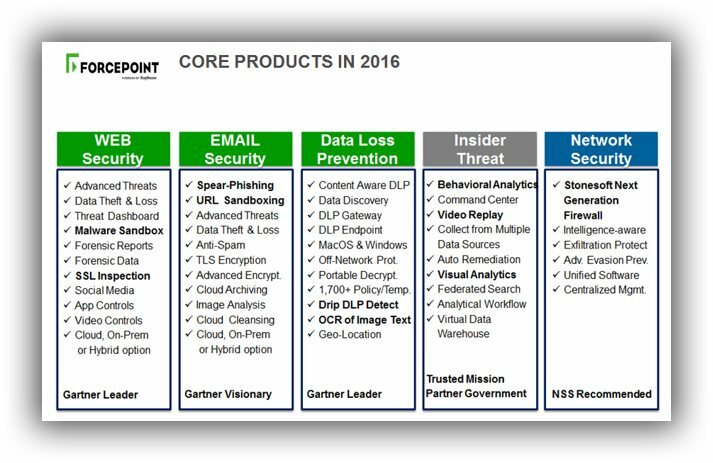 We will be posting a lot more information in the weeks/months ahead, but below is a handy summary of what products Forcepoint has to offer. Don’t be surprised if you find one that fits your business model! Each product covers a base when talking about cybersecurity and how it affects (and will affect) businesses. For more about Forcepoint and their range of products check out their website!